New Directions Modern Readers Series (not to be confused with Macmillan’s Modern Readers’ Series, available through about 1950) was announced in 1946 and the first title published in 1947. 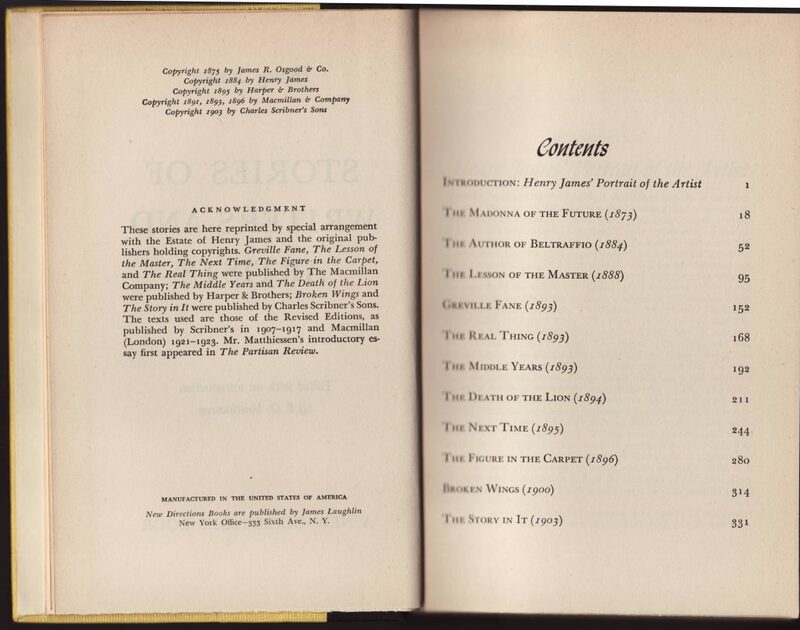 This series was adjunct to the New Classics Series, published first in 1939: it contained books that were too long for the smaller format New Classics Series (source). Also, some of the titles were printed from plates acquired from other publishers: printing from existing plates would save the publisher money (no need to reset the typography for the books in the smaller format used by the New Classics Series). 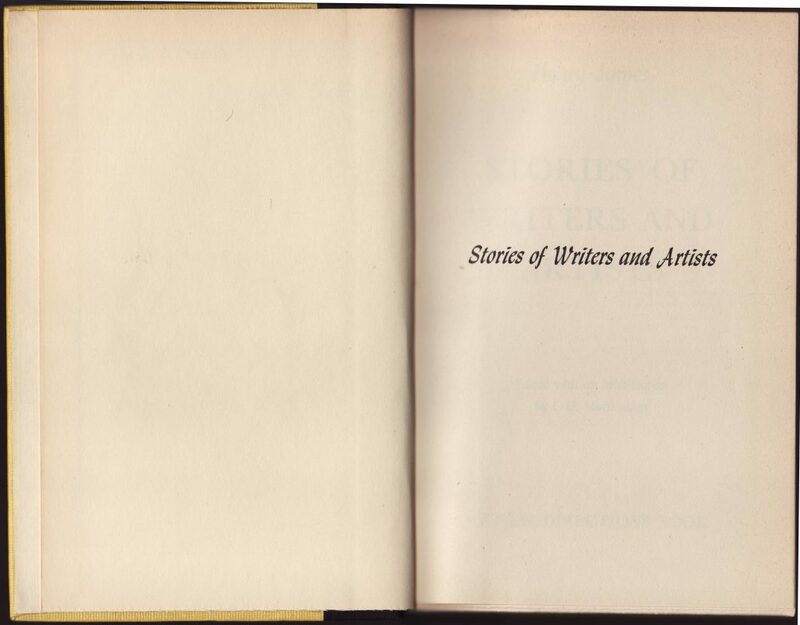 The Modern Readers Series only included seven titles, the last published in 1949 (source). The series is advertised through the early 1950s. Some of the jacket artwork for the series is reused on New Directions paperback editions of series titles, published beginning in the late 1950s. 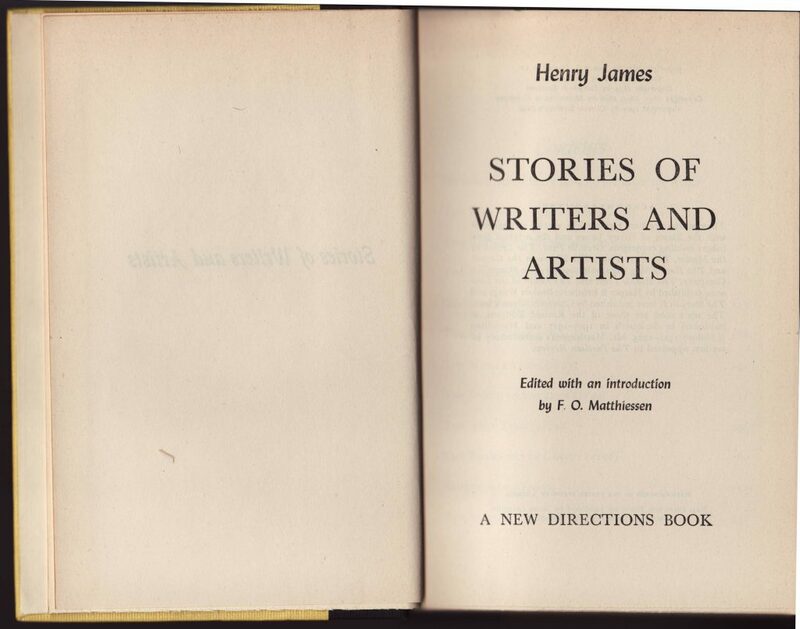 Henry James’ Stories of Artists & Writers is an anthology edited by F.O. Matthiessen, first published by New Directions in 1940 and, it seems, reprinted in 1945 and 1948. 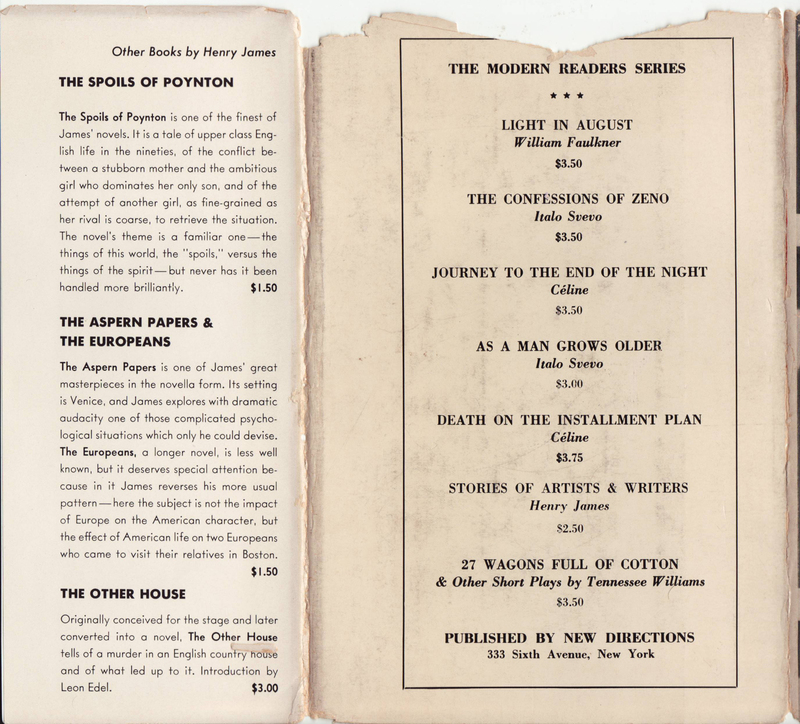 The book, possibly just rejacketed, is included in the Modern Readers Series in 1949. The title was reprinted as a New Directions paperback in 1956. Jackets for the Modern Readers Series were unique to each title. 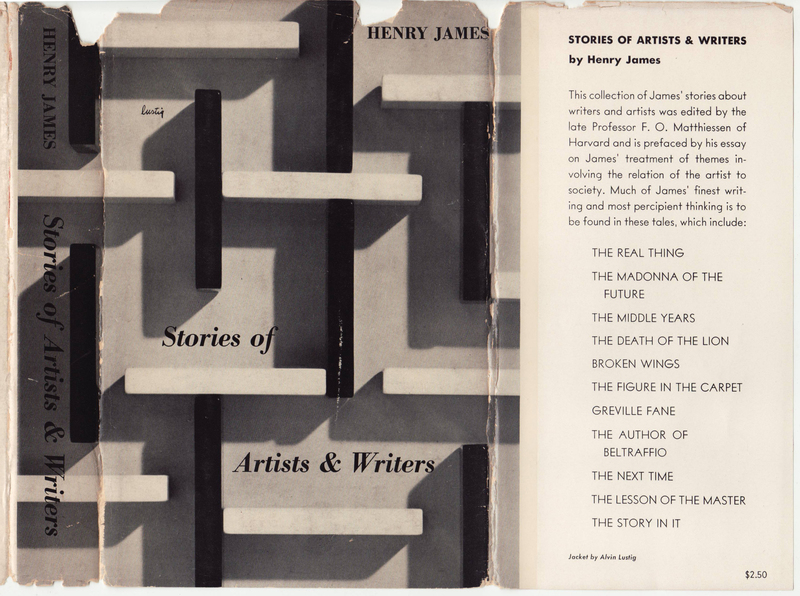 All jackets were designed by Alvin Lustig but consisted of photographs or photographic montages rather than the graphic designs illustrating the New Classics Series. The series name is not included on the spine, front or front flap of the jacket. The front flap describes the collection and lists the stories. The price is $2.50. The back of the jacket lists the seven titles in the series. It does not seem that any more were added after the Tennessee Williams title. Prices range from $2.50 to $3.75. 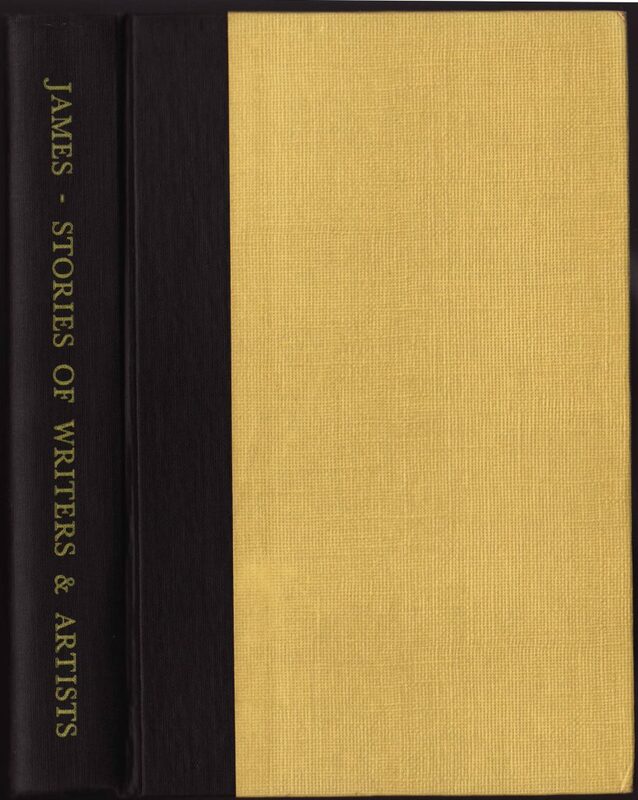 The rear jacket flap includes other James titles published by New Directions. The series name at the top of the jacket back is the only place it is indicated (and it is not printed on or in the book itself). The book is quarter bound in black and yellow, with the author and title on the spine in yellow. Other series bindings seem to be in one color cloth, again suggesting this title was possibly the original (non-series) book rejacketed and included in the series. The series name is not mentioned on or in the book. The copyright page: no publication or copyright date (for New Directions) is indicated.